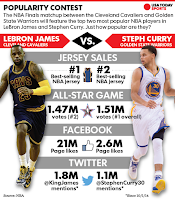 Een Grote Dag dus ook voor de nieuwe Kleding-Sponsor van de NBA, voor Nike dus! The official start to the 2017-2018 NBA season last night (Oct. 17) wasn’t just an exciting moment for players and fans. For Nike, it was maybe a bigger deal than for anyone else. 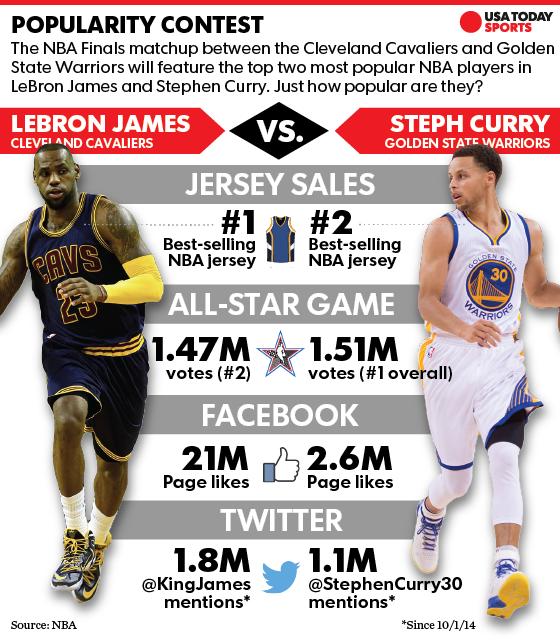 After years of waiting, this game marked the real tip-off of Nike’s role as the exclusive apparel provider of the NBA. The game itself could hardly have offered a better stage. It was a drama-filled match between the Cleveland Cavaliers and the Boston Celtics. Two of Nike’s biggest stars, LeBron James and Kyrie Irving, faced off as opponents, after Irving left the Cavs this summer and joined the Celtics because he reportedly didn’t want to share the spotlight with James anymore. James’s jersey tore right down the middle. First game of Nike’s NBA jersey deal, Nike’s biggest spokesperson is playing in a ripped jersey. 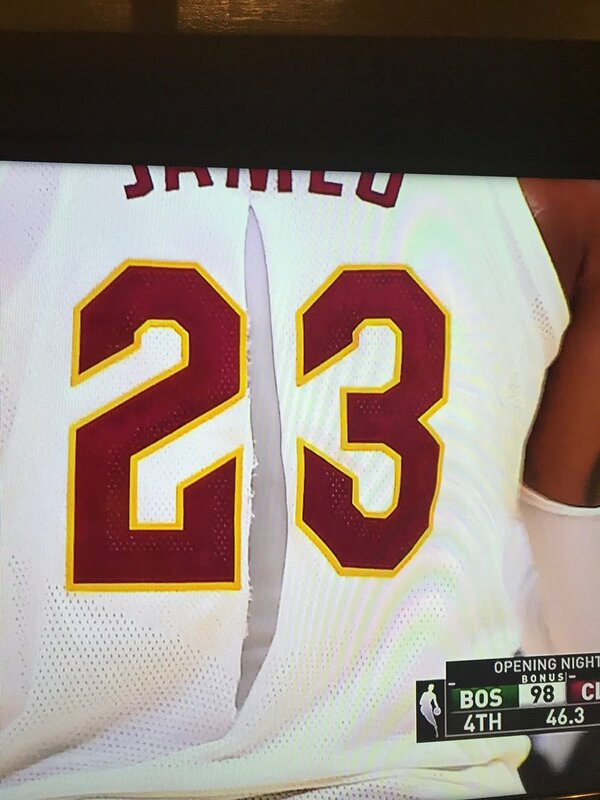 The back of LeBron’s jersey ripped somewhere along the lines of that play. A large and very noticeable tear opened up in James’s jersey during the game after a minor grab by the Celtics’ Jaylen Brown. It was the sort of contact that happens all the time, and probably shouldn’t have been enough to rip the jersey. Lebron's jersey gets ripped on a quick grab by Jaylen Brown. What’s worse, as the announcers pointed out, it wasn’t the first time one of Nike’s new jerseys has ripped. Tyler Ennis’s jersey tore similarly during the Los Angeles Lakers’ preseason opener a couple weeks ago. Again, it was the result of a grab, and the jersey ripped apart right down the middle. Aaron Brooks ripping Tyler Ennis’ jersey. Nike had been touting its new jerseys because it used 3D body maps of players to optimize the shape and says the material wicks sweat much better than previous jerseys. That material is polyester made from recycled plastic equivalent to about 20 water bottles, making the jerseys a good promoter of Nike’s sustainability efforts, too. Why they seem to keep ripping isn’t exactly clear. We’ve reached out to Nike for comment and will update this story with any reply. But a public problem with its products is not what Nike needs right now. Nike and its Jordan subsidiary are ceding ground to Adidas. Nike has been hoping its NBA deal would reignite some heat around the brand, which is also suffering as consumers leave basketball sneakers on the shelves and opt for more casual, fashion-forward styles. Two torn jerseys—so far, anyway—aren’t an unfixable disaster. But for a brand that prides itself on making premium performance products for athletes, it’s not how Nike wanted to start off its new role as the NBA’s official outfitter.